My friend Beth hates this question. I love it. For me, it is the creative ending to my busy day. A chance to express my artsy side. Hanging out in the kitchen is a time for family to connect after a long day. Sometimes I will stop at the grocery on the way home from work if I want to make something fresh, like fish. But usually, I just head to my fridge, freezer and pantry. Then I unleash the creative juices! So last night, this is what I pulled out for dinner. 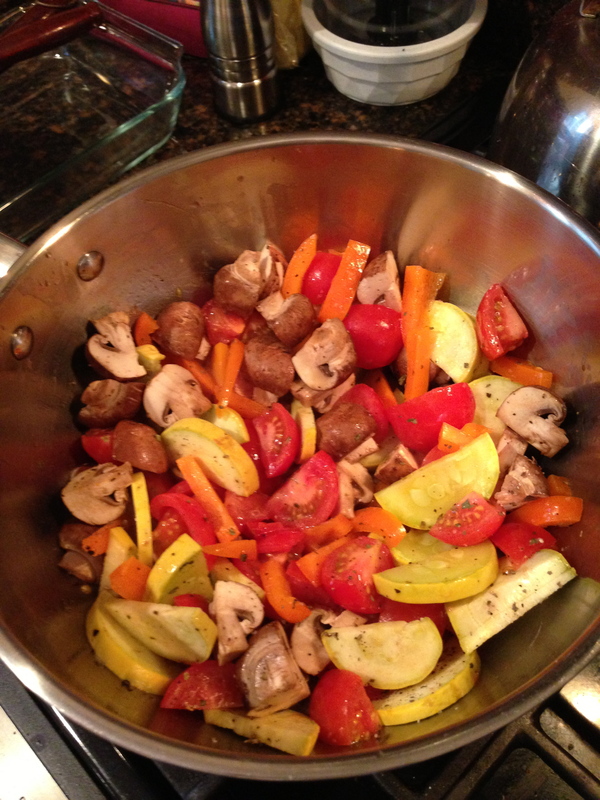 Fresh leftover veggies including tomatoes, mushrooms, and yellow squash. And that, my friends, was dinner. I started with the chicken. I seasoned the meat simply, with salt, pepper, and herb de Provence. After starting the grill and letting it get hot, I plopped the chicken on there to cook. Meanwhile, I started a pot of water to boil, and then cut the veggies up. When the chicken was done, I brought it back inside and tented it with some tin foil. It is a perfect way for meat to stay hot and juicy, and meat should always “rest” for 10-20 minutes prior to serving. Then I tossed the pasta into the water for its 10 minute boil time and sautéed the veggies in a bit of olive oil. I seasoned the veggies with a bit of salt, pepper, red pepper flakes, and some basil. Simple. These are the veggies that I sautéed for dinner! As the pasta finished cooking, my son set the table. It was, after all, Manners Monday, so we talked about table settings and appropriate dinner conversation topics. In my home, while I cook the other family members (and even guests!) are helping to get the meal on the table. Meals are, after all, a family affair, and all should be present and participating. Setting the table, pouring water, placing napkins out…these are all necessary prior to the meal coming to the table. Everyone pitches in. And to keep the mood light and joyful, I always have music playing. Okay, so next I drained the pasta, chopped up the chicken, finished sautéing the veggies and tossed it all together back in my big stock pot that the pasta cooked in. Conserving dishes is important on most work nights! We loaded up our plates and to the table we went. Quick, nutritious, homemade, and voila! A family meal, and moment, came together. Try it. What’s in your fridge? What are you making for dinner? Dinner! 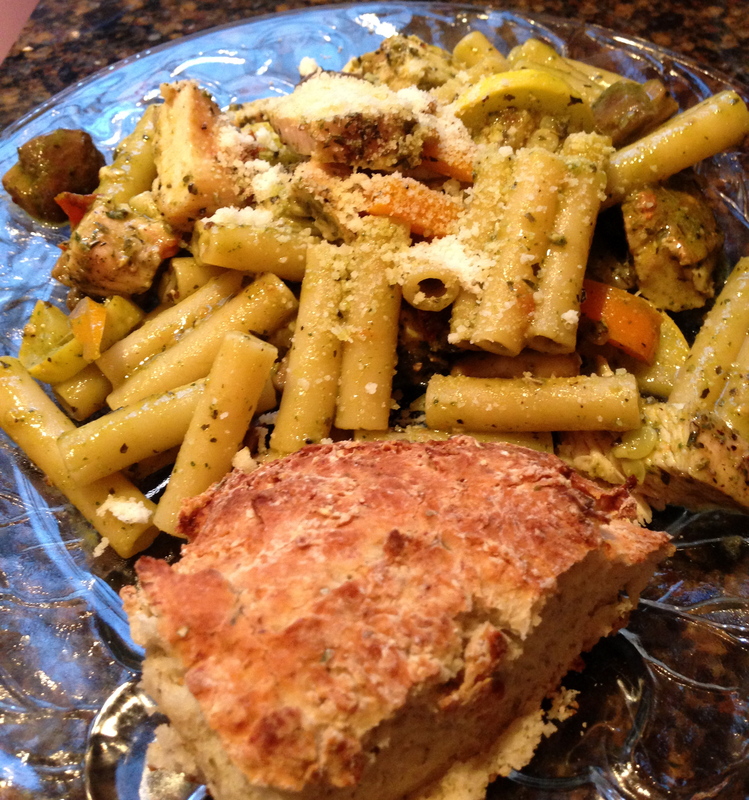 Pasta and veggies with pesto, and crusty bread! Yummy and easy!